Minimalist packaging can deliver a lot of benefits to companies: from lower manufacturing costs at the beginning of the process, all the way to better shelf presence in the store. We can look at minimalist design from a couple of perspectives. 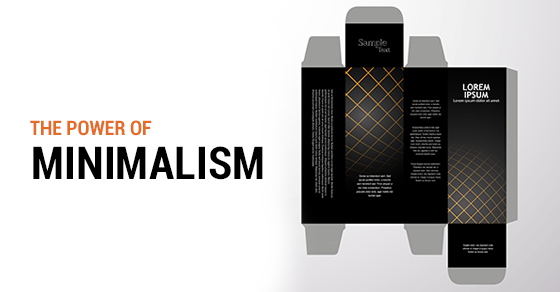 On one hand, you can look for package design that is minimalist in its form and structure. Finding ways to simplify and pare down your package design open up a lot of interesting opportunities. This is one of the most immediate and obvious benefits of minimal packaging. The less material you need to construct your packages, the less you will have to spend on that material. Minimal packaging is also lighter packaging. If your packaged products have to be shipped over long distances, their weight can make a big difference. Both of the above qualities are not just good for your bottom line – they are also good for the environment. Eco-friendly practices may also help attract customers who care about sustainability. Simpler packaging that utilizes fewer different materials is often easier to recycle – further boosting your environmental credibility. In some cases, new package design leads to entirely new and useful ways of engaging with the product. For example, squeezable baby food containers are easier and cleaner to use than jars, and use less material. Other new package designs can also be re-used as bags or boxes. A label free of clutter projects a sense of quiet confidence. It shows that the virtues of your product stand on their own, and don’t need flashy or busy graphics to distract the customer. This might seem counterintuitive at first, but a minimalist design can actually be more eye-catching than an elaborate design. When all the other packages on the shelf are overflowing with text and images, a simple design will stand out. With nothing else to distract the eye, your minimal design can clearly communicate what your product is and what goes into it. Furthermore, this approach conveys honesty since you are showing that you have nothing to hide.